Aging is characterized by the progressive decline in cellular and organismal functions that lead to reduction of fitness and increased risks to diseases and death. Epigenetic alterations in histone modification represent a prominent hallmark of aging (Sen et al., 2016). Chromatin and epigenetic complexes that modify histones regulate the accessibility of DNA to transcriptional machinery, thereby permitting direct control of gene expression (Kouzarides, 2007). Previous studies have established that changes in histone markings, such as acetylation on histone H4 at lysine 16 (H4K16ac) in Saccharomyces cerevisiae (Dang et al., 2009), trimethylation on histone H3 at lysine 4 (H3K4me3) in Caenorhabditis elegans (Han et al., 2017), and trimethylation on histone H3 at lysine 36 (H3K36me3) in S. cerevisiae, C. elegans and Drosophila melanogaster substantially impact adult lifespan (Pu et al., 2015; Sen et al., 2015). Polycomb repressive complexes (PRCs), including PRC1 (Shao et al., 1999) and PRC2 (Kuzmichev et al., 2002), are important histone-modifying enzymes (Czermin et al., 2002; Müller et al., 2002; Saurin et al., 2001) that are evolutionally conserved from the worm to Drosophila and mammals (Whitcomb et al., 2007). Tri-methylated histone H3 at lysine 27 (H3K27me3) denotes transcriptional silencing, which is produced by PRC2 (Czermin et al., 2002; Müller et al., 2002) and functionally maintained by PRC1 (Cao et al., 2002). Although mutation in the H3K27me3 demethylase couples an increase of H3K27me3 with longevity in C.elegans (Jin et al., 2011; Maures et al., 2011), reducing H3K27me3 by heterozygous mutation in the H3K27me3 methyltransferase results in lifespan extension in both C. elegans and D. melanogaster (Ni et al., 2012; Siebold et al., 2010). Hence, it remains unclear whether the life-benefit phenotype is due to manipulation of specific genes or modulatory effect of H3K27me3. Importantly, H3K27me3 levels are known to increase with age (Liu et al., 2013; Sun et al., 2014); however, the manner by which H3K27me3 epigenome changes over the course of lifespan and its consequent impact on the progression of aging have not been addressed. Metabolic homeostasis is intimately connected with aging and lifespan regulation (López-Otín et al., 2016). Glucose is the dominant provider of energy for cells. Glycolysis, the first step in the breakdown of glucose to extract energy in the form of ATP for cellular metabolism, is present in all cellular organisms and critical for life. The anti-aging effect of caloric restriction correlates with a metabolic feature of limiting glucose metabolism including a reduction of glycolysis (Feuers et al., 1989). On the other hand, glycolysis is essentially involved in a wide-range of biological processes (Chang et al., 2013; Okamoto et al., 2001; Volkenhoff et al., 2015). It is unclear, however, how the beneficial outcome of restricting glucose metabolism and glycolysis as a result of caloric restriction could be reconciled with the essential role of glycolysis during normal adult lifespan. Strikingly, decreased brain glucose metabolism is present prior to the onset of clinic symptoms in individuals at risk of Alzheimer's disease (Cunnane et al., 2011). Since aging is the most significant factor for human neurodegenerative diseases, it is important to better understand how glycolysis is modulated with age and whether modulation of glycolytic process could impact adult lifespan. Mounting evidence associates aging with epigenetic, transcriptional, and metabolic alterations (López-Otín et al., 2013), yet how these processes are integrated into the regulation of adult physiology is only beginning to be revealed. 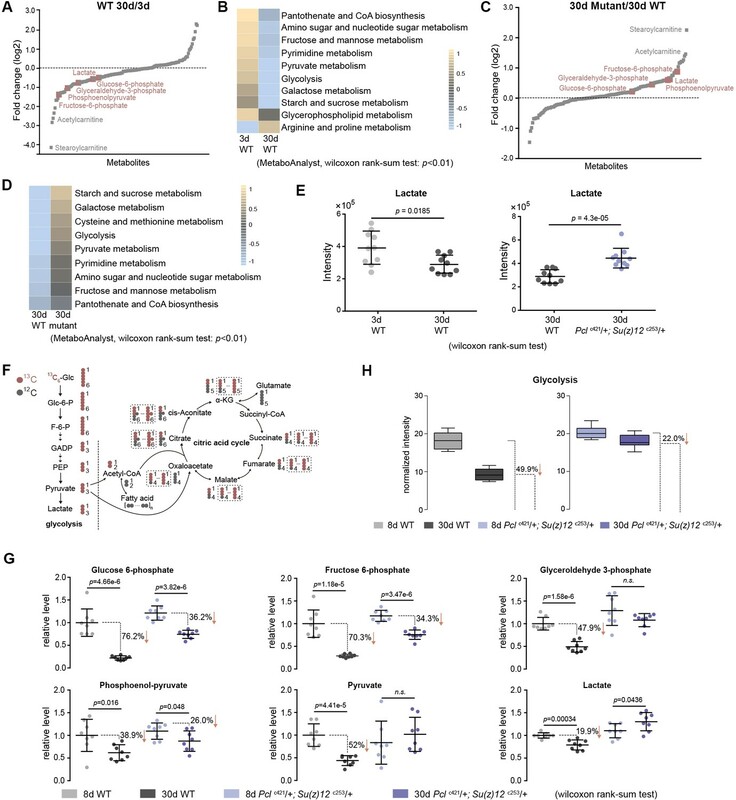 Although epigenetic effects could potentially elicit broad regulatory mechanisms, it remains to be determined whether epigenetic modulations are simply associated with aging or directly contribute to transcriptional and metabolic modulations that profoundly impact adult lifespan. Here, using Drosophila, we discover that adult-onset fidelity loss results in epigenetic drift of H3K27me3, which in turn impinges on the transcription and metabolism of the glycolytic pathway. 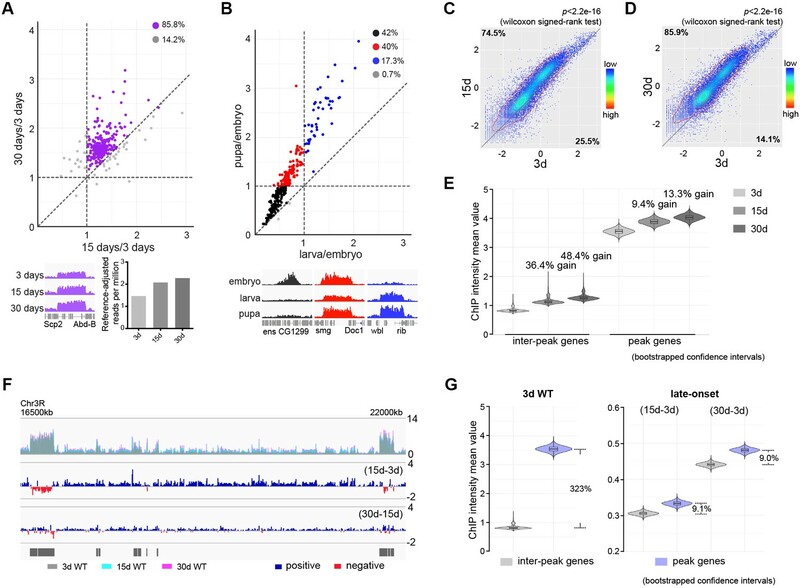 Our data presented in this study are consistent with the model that epigenetic drift of H3K27me3 is one of the molecular mechanisms that contribute to at least a subset of age-associated phenotypes and limit lifespan in Drosophila. Moreover, we reveal that a reduction of H3K27me3 by PRC2-deficiency stimulates glycolysis and healthy lifespan. Our study proposes that, during natural aging, stimulation of glycolysis promotes metabolic health and longevity. H3K27me3 is a signature histone modification, but its dynamics at the epigenome level during aging has not been studied. To characterize H3K27me3 during aging, we examined the level of H3K27me3 in muscle by western blot and revealed an age-associated increase in wild-type (WT) flies (Figure 1—figure supplement 1A). To quantitatively profile H3K27me3, we adapted the chromatin immunoprecipitation (ChIP) followed by high-throughput DNA sequencing with reference exogenous genome method (ChIP-Rx) (Bonhoure et al., 2014; Orlando et al., 2014) in fly muscle tissues (Figure 1—figure supplement 1B). We generated H3K27me3 epigenome profiles in adult flies of 3, 15, and 30d. In addition, we also sampled embryo, larvae, and pupae to examine H3K27me3 epigenome profiles during development. Surprisingly, despite the fact that H3K27me3 levels increased with age, H3K27me3 peak profiles in the aging adult remained largely unchanged (Figure 1A). In a sharp contrast, H3K27me3 signals during developmental stages showed dramatic gain or loss (Figure 1B). This evidence highlights a distinct, yet unknown mechanism of H3K27me3 modification that occurs during aging. Adult-onset fidelity loss results in epigenetic drift of H3K27me3. (A) H3K27me3 peak profiles are comparable between young and aged animals. A scatter plot (top panel) of 331 peaks and a genome browser mini-view (bottom, left panel) illustrated that H3K27me3 had comparable peak profiles between young and aged animals. Peaks were identified from four biological replicates of 3d and 30d male flies using Homer. Data plotted are mean values of peak region at 15d (X-axis) or 30d (Y-axis) as compared to 3d. Each dot on the plot represents a peak locus. For quantitative comparison, the dm6 mapped reads were normalized to a scale factor using deeptools function bamCoverage (see Materials and methods for further details). Majority of peak regions were well maintained during aging (purple). Bar chart (bottom, right panel) showed that the number of Reference-adjusted Reads Per Million (RRPM) using ChIP-Rx datasets, exhibiting a progressive increase of H3K27me3 level with age. ChIP-seq was from muscle tissues of 3-, 15-, and 30d-old male flies. Genotype: 5905. (B) H3K27me3 modification undergoes dramatic gain or loss during development. A scatter plot (top panel) of 300 peaks showed dynamic changes of H3K27me3 signals during embryo, larvae, and pupae. Peaks were identified from two biological replicates of three developmental stages. Data plotted are mean values of peak region at larva (X-axis) or pupa (Y-axis) as compared to embryo. Each dot on the plot represents a peak locus. A scale factor normalized dm6 mapped reads were used to generate the mean value of each peak. Method same as (A). As illustrated by the genome browser mini-view for select genes (bottom panel), H3K27me3 modification was either embryo-specific (black) or selectively decreased in larvae (red), or progressively increased from embryo, larvae to pupae (blue). ChIP-seq was from whole embryo, larvae, and pupae. Genotype as in (A). (C) and (D) H3K27me3 modification increases with age. Scatter plot showed H3K27me3 levels for protein-coding genes (transcriptional start site to transcriptional termination sites as annotated in dm6) of in 3d as compared to 15d (C) and 30d (D). (wilcoxon signed-rank test, p<2.2e-16). The dm6 mapped reads were normalized to a scale factor to compare the relative H3K27me3 level quantitatively. Each dot on the plot represents a single gene locus. X- and Y-axis represented log2 mean value of gene’s reference-adjusted reads. Contour lines indicated that H3K27me3 signals were higher in aged flies compared to 3d-old flies. ChIP-seq and genotype as in (A). (E) Inter-peak genes receive relatively more H3K27me3 modification during aging. We used bootstrapping to generate the mean reference-adjusted ChIP intensity of peak genes or inter-peak genes (10,000 draws with replacement of n = 500). Violin plots represent the bootstrapped mean H3K27me3 level of inter-peak genes (left) and peak genes (right) at 3d, 15d, and 30d. In aging flies, inter-peak genes gained relatively more signal (15d: 36.4%, 30d: 48.4%) than peak genes (15d: 9.4%, 30d: 13.3%). Net gain of H3K27me3 signals during aging was calculated by a subtraction of the mean signal intensity between aged and 3d. Bootstrapped 95% confidence intervals: 3d inter-peak genes: [0.758, 1.017]; 15d inter-peak genes: [1.023, 1.401]; 30d inter-peak genes: [1.149, 1.562]; 3d peak genes: [3.349, 3.739]; 15d peak genes: [3.681, 4.075]; 30d peak genes: [3.817, 4.230]. ChIP-seq and genotype as in (A). (F) H3K27me3 modification during aging has reduced selectivity. Genome browser view of a 5.5 Mb region in the chromosome 3R was shown. H3K27me3 occupancy overlaid between 3d (grey), 15d (cyan), and 30d (pink) (top panel). H3K27me3 modification during aging was shown by deducting 3d signals from those at 15d (middle panel) and by deducting 15d signals from those at 30d of age (bottom panel). The increased modifications had no direct correlation with pre-existing peaks. Black boxes and lines represented peak regions, corresponding to their chromosomal locations. ChIP-seq and genotype as in (A). (G) Violin plots indicate that signals are highly preferential at the peak regions at 3d (left, about 323% more signal compared to inter-peak), but for signals gained during aging, selectivity is dramatically reduced (right, only about 9% more signal acquired by peak than inter-peak). Method same as (E). The proportion of more signals in peak genes was computed by a subtraction of the mean signal intensity between peak genes and inter-peak genes. Bootstrapped 95% confidence intervals: 3d inter-peak genes: [0.758, 1.017]; 3d peak genes: [3.349, 3.739]; late-onset (15d-3d) inter-peak genes: [0.295, 0.315]; (15d-3d) peak genes: [0.320, 0.345]; (30d-3d) inter-peak genes: [0.430, 0.452]; (30d-3d) peak genes: [0.468, 0.493]. ChIP-seq and genotype as in (A). To define the landscape of aging epigenome, we divided distribution of H3K27me3 into peak regions (IP/input ≥ 2 and signal spanning ≥3 kb) and inter-peak regions. Analysis in 3d WT revealed 222 peak regions reproducibly identified from a total of four replicates, which covered approximately 9.73 Mbp of the genome (Figure 1—figure supplement 1C, Supplementary file 1). Analysis of global occupancy of H3K27me3 between young and aged WT exhibited comparable patterns (pair-wise Pearson correlation coefficients ≥ 0.70) (Figure 1—figure supplement 1D), demonstrating that the genome-wide distributions of H3K27me3, particularly the peak regions, are maintained in aged WT. We next analyzed signal intensity of individual genes using reference-adjusted read counts. Scatter plots demonstrated that H3K27me3 signals in WT clearly had an adult-onset, progressive increase (Figure 1C and D). To further characterize H3K27me3 dynamics, we sorted individual genes into peak genes (1141 genes) according to the peak regions and genes therein covered (see Supplementary file 1 for peak regions and included genes) or inter-peak genes (16370 genes). In aging WT flies, despite a genome-wide increase, we noted that inter-peak genes gained relatively more signals than those of peak genes (Figure 1E). To quantify the H3K27me3 marks gained specifically during aging, we subtracted the signals of 3d from those of older age points. Genome browser views illustrated that subtracted signals propagated along the chromosome, showing no direct correlation with pre-existing peaks (Figure 1F). We then extended this analysis to the entire epigenome. Modification in flies that were 3d old was predominantly biased at the peaks, with approximately 323% more signals as compared to the inter-peaks (Figure 1G). In contrast, the signals acquired during aging were only about 9% more at the peaks than those at the inter-peaks (Figure 1G), suggesting that there was a dramatic shift in the pattern of H3K27me3 modification in aging. Altogether, analysis of H3K27me3 aging dynamics implicates a strong selection on peak regions compared to inter-peak regions when animals are young; however, adult-onset modification of H3K27me3 becomes less biased at the peak regions. Given that above study indicated a new feature of H3K27me3 dynamics at the epigenome level during adult lifespan, we further explored the roles of epigenetic pathways in the aging process via an unbiased deficiency-based genetic screen. Using CRISPR/Cas9 mutagenesis (Ren et al., 2013), we systematically generated site-specific deletion mutants of 24 key regulators involved in distinct epigenetic and chromatin modifications in the same homogenous genetic background (Supplementary file 2). Since the effects of epigenetic genes are usually dose-dependent, we analyzed adult survival using heterozygous mutants. Lifespan analysis demonstrated that whereas majority of mutants showed mild or no effect, animals deficient in PRCs, including esc, E(z), Pcl, Su(z)12 of PRC2 and Psc and Su(z)2 of PRC1, lived substantially longer (Figure 2A, Figure 2—figure supplement 1A, Supplementary file 2). Roles of select PRC2 factors have been previously implicated in Drosophila lifespan regulation (Siebold et al., 2010), although the underlying mechanism remains to be addressed. In addition, it was still possible that life-extension might be due to manipulations of individual genes, but not linked to the epigenetic change of H3K27me3. We further examined pairwise combinations of PRC2 double mutants in trans-heterozygosity. 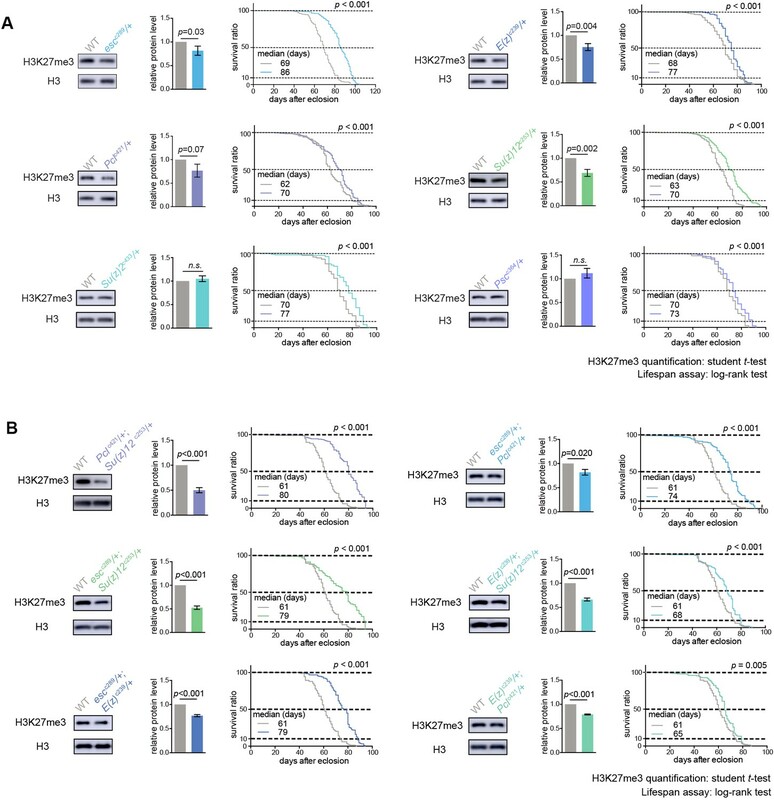 Remarkably, double mutants demonstrated more striking effects on H3K27me3-reduction and life-extension (Figure 2B, Figure 2—figure supplement 1B). Identification of multiple components of PRC2 and PRC1 in the screen is interesting, suggesting the involvement of the epigenetic changes regulated by these two complexes in animal lifespan. PRCs-deficient animals have extended lifespan. (A) PRCs-deficient animals have extended lifespan. H3K27me3 western blot (left), H3K27me3 quantification (middle), and lifespan curve (right) for PRC single mutants. PRC2 heterozygous mutants of indicated genotype reduce H3K27me3 levels and extend lifespan; PRC1 heterozygous mutants of indicated genotype extend lifespan without changing H3K27me3 levels. To name new mutant, a superscript amended to the gene contained a letter c denoting CRISPR/Cas9 method followed by the size of genomic deletion. All mutants have been backcrossed with WT for five times to ensure a uniform genetic background. See also Figure 2—figure supplement 1A. Western blot was from head tissues of 3d-old male flies. (for H3K27me3 quantification: mean ±SD of three biological repeats; student t-test; for lifespan assay: 25°C; n ≥ 200 per genotype for curve; log-rank test). (B) Pair-wise combination of PRC2 trans-heterozygous double mutants of indicated genotype results in stronger effects in H3K27me3-reduction and life-extension. See also Figure 2—figure supplement 1B. Western blot was from head tissues of 3d-old male flies. (for H3K27me3 quantification: mean ±SD of three biological repeats; student t-test; for lifespan assay: 25°C; n ≥ 200 per genotype for curve; log-rank test). We then investigated whether the age-delaying effect of PRCs-deficiency might be due to its ability to modulate H3K27me3 dynamics with age. Using muscle tissues, we examined the modification of H3K27me3 in young (3d) and aged (30d) mutants with their age-matched WT controls. For this and subsequent experiments, we studied the PRC2 deficiency using Pclc421 Su(z)12c253 trans-heterozygote double mutants, which gave rise to the strongest effect in H3K27me3-reduction and life-extension. Of note, western blot analysis showed that only H3K27me2/3 were selectively reduced in PRC2 mutants, while other histone markings remained unchanged (Figure 3—figure supplement 1A). Interestingly, global occupancy of H3K27me3 between WT and age-matched PRC2 mutants was preserved, as demonstrated by the comparable patterns of peak profiles and genes known to be H3K27me3-modified (pair-wise Pearson correlation coefficients ≥ 0.77) (Figure 3A, Figure 3—figure supplement 1B and C), although we cannot rule out the possibility that certain H3K27me3 targets might be altered. H3K27me3 signals in WT were generally higher than those in mutants (Figure 3B, see Figure 3—figure supplement 1D for escc289 E(z)c239). In PRC2 mutants at 3d where H3K27me3 bulk levels were substantially decreased, interestingly, the signals became more likely to coalesce into the peak regions (Figure 3C, see Figure 3—figure supplement 1E for escc289 E(z)c239). Given limited H3K27me3 repertoire in the mutants, this shift might be critical for the establishment of the peaks. In aging PRC2 mutants, adult-onset modification was less biased or even decreased at the peaks (Figure 3D, see Figure 3—figure supplement 1F for escc289 E(z)c239). More strikingly, age-associated shift in H3K27me3 modification that occurred in WT was now dampened in mutants (Figure 3E, see Figure 3—figure supplement 1G for escc289 E(z)c239). This evidence potentially indicates that PRC2-mutation mitigates the drifting of H3K27me3 that occurs during natural aging. Long-lived PRC2 mutants diminish the epigenetic drift of H3K27me3 during aging. (A) Circos plot of the H3K27me3 epigenome illustrates peak profiles that are highly preserved with age and in PRC2 mutants. Black boxes and lines (innermost circle) represented common peak regions, corresponding to their chromosomal locations. Chromosome ideogram was in grey (outermost ring). PRC2 target genes previously found in cells and during development were shown next to their epigenomic loci. ChIP-seq was from muscle tissues of 3d- and 30d-old male flies. Genotypes: WT: 5905 and Pclc421/+; Su(z)12 c253/+. (B) H3K27me3 modification decreases in PRC2 mutants. Scatter plot showed H3K27me3 levels for gene bodies of all protein-coding genes in Pclc421; Su(z)12c253 as compared to WT. (wilcoxon signed-rank test, p<2.2e-16). Each dot on the plot represents a single gene locus. X- and Y-axis represented log2 mean value of genes’ reference-adjusted reads. Contour lines indicated that H3K27me3 signals were generally higher in WT compared to mutants. ChIP-seq was from muscle tissues of 3d-old male flies. Genotypes as in (A). (C) Inter-peak genes receive relatively less H3K27me3 modification in PRC2 mutants. In PRC2 mutant, inter-peak genes received relatively less signal (25.1%) than those of peak genes (13.7%). Reduction of signals was calculated by a subtraction of the mean signal intensity between WT and PRC2 mutants. Bootstrapped 95% confidence intervals: 3d inter-peak genes: [1.317, 1.861]; 3d Pclc421; Su(z)12c253 inter-peak genes: [0.944, 1.361]; 3d peak genes: [3.946, 4.414]; 3d Pcl421; Su(z)12253 peak genes: [3.364, 3.861]. ChIP-seq and genotypes as in (A). (D) Modification of H3K27me3 during aging has reduced selectivity in PRC2 mutants. Bootstrapped 95% confidence intervals: Pcl421; Su(z)12253 late-onset inter-peak genes: [0.053, 0.147]; Pcl421; Su(z)12253 late-onset peak genes: [−0.778,–0.578]. ChIP-seq was from muscle tissues of 3d and 30d old male flies. Genotypes: Pclc421/+; Su(z)12 c253/+. (E) Age-associated drifting of H3K27me3 is dampened in PRC2 mutants. Scatter plot showed gained H3K27me3 signal for all protein-coding genes in aged Pclc421; Su(z)12c253 and WT flies compared to young flies. Each dot on the plot represents a single gene locus. X- and Y-axis represented signal intensity transformed by Log2. Contour lines indicated that the majority of the gene signals displayed higher levels—thus more rapid changes—in aged WT compared to mutants. ChIP-seq and genotypes as in (A). To extend this analysis beyond muscle tissues, we further profiled H3K27me3 using dissected heads of Pclc421 Su(z)12c253 mutants and their age-matched WT controls. Similarly, our data shows that H3K27me3 in heads has age-associated increase and drift during normal aging in WT animals, and that this shift can be partially diminished by PRC2-mutation (Figure 4, Figure 4—figure supplement 1). Epigenetic drifting of H3K27me3 occurs with age in head. (A) H3K27me3 modification increases with age in head. Scatter plot showed H3K27me3 levels for protein-coding genes (transcriptional start site to transcriptional termination sites as annotated in dm6) of in 3d as compared to 30d. (wilcoxon signed-rank test, p<2.2e-16). The dm6 mapped reads were normalized to a scale factor to quantitatively compare the relative H3K27me3 level. Each dot on the plot represents a single gene locus. X- and Y-axis represented log2 mean value of gene’s reference-adjusted reads. Contour lines indicated that H3K27me3 signals were generally higher in aged compared to 3d-old flies. ChIP-seq was from head tissues of 3d- and 30d-old male flies. Genotype: 5905. (B) Inter-peak genes receive relatively more H3K27me3 modification during aging. We used bootstrapping to generate the mean reference-adjusted ChIP intensity of peak genes or inter-peak genes (10,000 draws with replacement of n = 500). Violin plots represent the bootstrapped mean H3K27me3 level of inter-peak genes (left) and peak genes (right) at 3d and 30d. In aging flies, inter-peak genes gained relatively more signal (30d: 18.8%) than peak genes (30d: 1.1%). Net gain of H3K27me3 signals during aging was calculated by a subtraction of the mean signal intensity between aged and 3d. Bootstrapped 95% confidence intervals: 3d inter-peak genes: [1.907, 2.027]; 30d inter-peak genes: [2.263, 2.402]; 3d peak genes: [6.912, 7.146]; 30d peak genes: [6.985, 7.217]. ChIP-seq and genotype as in (A). (C) Violin plots indicate that signals are highly preferential at the peak regions at 3d (left), but for signals gained during aging, selectivity is dramatically reduced (right). Statistics analysis as in (B). Bootstrapped 95% confidence intervals: 3d inter-peak genes: [1.907, 2.027]; 3d peak genes: [6.912, 7.146]; late-onset (30d-3d) inter-peak genes: [0.2756, 0.505]; (30d-3d) peak genes: [−0.136,0.248]. ChIP-seq and genotype as in (A). (D) H3K27me3 modification decreases in PRC2 mutants. Scatter plot showed H3K27me3 levels for gene bodies of all protein-coding genes in Pclc421; Su(z)12c253 as compared to WT. (wilcoxon signed-rank test, p<2.2e-16). Each dot on the plot represents a single gene locus. X- and Y-axis represented log2 mean value of gene’s reference-adjusted reads. Contour lines indicated that H3K27me3 signals were generally higher in WT compared to mutants. ChIP-seq was from head tissues of 3d-old male flies. Genotypes: WT: 5905 and Pclc421/+; Su(z)12 c253/+. (E) Inter-peak genes receive relatively less H3K27me3 modification in PRC2 mutants. In PRC2 mutant, inter-peak genes received relatively less signal (38.9%) than those of peak genes (18.3%). Statistics analysis as in (B). Bootstrapped 95% confidence intervals: 30d WT inter-peak genes: [0.737, 0.783]; 30d Pclc421; Su(z)12c253 inter-peak genes: [0.4498, 0.4787]; 30d WT peak genes: [2.193, 2.268]; 30d Pcl421; Su(z)12253 peak genes: [1.787, 1.858]. ChIP-seq and genotypes as in (D). (F) Modification of H3K27me3 during aging has reduced selectivity in PRC2 mutants. Statistics analysis as in (B). Bootstrapped 95% confidence intervals: Pcl421; Su(z)12253 late-onset inter-peak genes: [0.0126, 0.026]; Pcl421; Su(z)12253 late-onset peak genes: [−0.076,–0.052]. ChIP-seq was from head tissues of 3d and 30d old male flies. Genotypes: Pclc421/+; Su(z)12 c253/+. (G) Age-associated drifting of H3K27me3 is dampened in PRC2 mutants. Scatter plot showed gained H3K27me3 signal for all protein-coding genes in aged Pclc421; Su(z)12c253 and WT flies compared to young flies. Each dot on the plot represents a single gene locus. X- and Y-axis represented signal intensity. Contour lines indicated that the majority of the gene signals displayed higher levels—thus more rapid changes—in aged WT compared to mutants. ChIP-seq was from head tissues of 3d and 30d-old male flies. Genotypes: WT: 5905 and Pclc421/+; Su(z)12 c253/+. Since biological activities of histone modification often link chromatin accessibility to gene expression (Kouzarides, 2007), we speculated that alterations in the levels of H3K27me3, a repressive epigenetic mark in transcription, could impact the transcriptome. We asked whether transcriptional change of particular genes might account for PRC2-dependent life-extension. Using muscle tissues, we generated RNA-seq datasets for polyA-selected mRNAs. Analysis of individual PRC2 mutants resulted in several hundreds of upregulated genes, most of which were those at the inter-peak regions (Figure 5—figure supplement 1A). On the other hand, analysis of 63 genes with known effects on aging, including genes in insulin/IGF-1, mTOR pathways, etc., revealed no consistent changes in the expression in PRC2 mutants (Supplementary file 3), thus excluding them from being the major contributors in mediating PRC2-dependent longevity. Interestingly, comparative transcriptomics converged on a common set of genes (Figure 5A, Supplementary file 3). Gene ontology (GO) analysis revealed that the ‘glycolytic process’ and closely related pathways were highlighted for genes upregulated (Figure 5A), while the ‘oxidation-reduction process’ was enriched for genes downregulated (Figure 5A). Using weighted gene co-expression network analysis (WGCNA) (Langfelder and Horvath, 2008), we determined the significance of highly correlated changes in the expression of glycolytic genes (Figure 5B). We then extended RNA-seq analysis to the heads, and further narrowed down to two glycolytic genes, Tpi and Pgi, whose expressions were upregulated in both tissue types across individual long-lived PRC2 mutants (Figure 5—figure supplement 1B and C, Supplementary file 4). As noted, glucose is metabolized through sequential reactions of glycolysis and the citric acid cycle. However, we found no consistent changes in the expression of genes mediating pentose phosphate pathway (PPP), citric acid cycle, and oxidative phosphorylation (Figure 5—figure supplement 1C, Supplementary file 4), suggesting modulatory effects on the glycolytic genes. Transcriptomics links H3K27me3 dynamics to the regulation of glycolytic genes. (A) Venn diagram shows genes commonly changed in PRC2 single mutants with indicated genotype (left panel). Differential expression genes were computed using DESeq based on normalized count from three biological replicates (p<0.05). Gene ontology (GO) analysis (performed by David) shows glycolysis being the biological processes significantly enriched for genes upregulated in PRC2 long-lived mutants, while oxidation-reduction process is the only pathway enriched for genes down-regulated. The bar graphs represent –log10 (p value) and gene counts in each pathway. RNA-seq was from muscle tissues of 30d-old male flies. (B) WGCNA network analysis reveals a co-regulated change of glycolytic genes. Glycolytic genes were highlighted. WGCNA was used for finding modules of highly correlated genes across mRNA-seq samples. For selected module, Cytoscape was used for visualizing interaction network. Glycolytic genes were highlighted as node, suggesting their expression was changed coordinately. (C) GO analysis shows biological processes related to energy metabolism being significantly decreased with age in WT. Age-dependent mRNA expression change was computed using DESeq based on mRNA-seq data from three biological replicates. GO analysis of 2298 down-regulated genes (cutoff: p<0.05) was performed by David. The top 10 most significantly affected biological processes were shown. The bar graphs represent –log10 (p value) and gene counts in each pathway. RNA-seq was from muscle tissues of 3d- and 30d-old male flies. Genotype: 5905. (D) Genes of glycolysis/gluconeogenesis as annotated in the Kyoto Encyclopedia of Genes and Genomes (KEGG) pathway database show age-associated transcriptional decrease. Y-axis represented normalized read counts transformed by Log2. (41 genes used; see Supplementary file 4; wilcoxon signed rank test, p=0.01). RNA-seq and genotype as in (C). (E) ChIP-qPCR validation. Genomic structures were shown according to the Flybase annotation (www.flybase.org). Along the gene of indicated genotype, a, b, c, and d were underlined, denoting the sites for PCR amplification. Color codes represented ATG (the translation start site), CDS (coding sequence), 5’UTR, and 3’UTR. Different primer sets confirmed that H3K27me3 modification was increased in aged WT and further increased in utx null mutants. H3K27me3 was reduced in PRC2 mutants as compared to WT, with the ratio between mutants and WT smaller than 1 (mean ±SD of three biological repeats; student t-test *p<0.05, **p<0.01; also see Figure 5—figure supplement 1D). ChIP-qPCR was from muscle tissues of 3d- and 30d-old male flies. Genotypes: WT: 5905. PRC2 mutant: Pclc421/+; Su(z)12 c253/+. utxc499/c499. (F–H) qRT-PCR analysis confirms that Tpi and Pgi of glycolytic genes have a decrease with age (F) but become increased in both PRC2 (G) and PRC1 mutants (H). (mean ±SD of three biological repeats; student t-test). qRT-PCR was from muscle tissues of 3d- and 30d-old male flies. Genotypes: WT: 5905. Pclc421/+; Su(z)12 c253/+. Su(z)2 c433/+. (I) H3K27me3 increases in utx deficiency. H3K27me3 western blot (top) and quantification (bottom). (for H3K27me3 quantification: mean ±SD of three biological repeats; student t-test). Western blot was from muscle tissues of 30d-old male flies. Genotypes: WT: 5905. utxc499/c499. (J) utx null animals are short-lived. (for lifespan assay: 25°C; n ≥ 200 per genotype for curve; log-rank test). Genotypes as in (I). (K) qRT-PCR analysis indicates a further decrease of glycolytic genes in utx-deficient animals. (mean ±SD of three biological repeats; student t-test). qRT-PCR was from muscle tissues of 30d-old male flies. Genotypes as in (I). Moreover, RNA-seq analyses of WT animals revealed that, although aging might exert a much broader effect on the changes of the transcriptome, genes downregulated with age were mainly enriched in carbohydrate metabolism and energy production (Figure 5C). In particular, we noted a transcriptional decline of genes related to glycolysis/gluconeogenesis in old animals (Figure 5D). To verify these results, we subsequently performed single-gene analysis on Tpi and Pgi with respect to their H3K27me3 states and mRNA levels using ChIP-qPCR (Figure 5E, Figure 5—figure supplement 1D) and qRT-PCR (Figure 5F and G), respectively. In addition to PRC2 mutants, we attested the transcriptional increase of these two glycolytic genes in Su(z)2c433, a long-lived PRC1 mutant (Figure 5H). Given the fact that H3K27me3 naturally increased with age, we investigated whether further increase of H3K27me3 could impact lifespan and gene expression. To address this, we examined flies deficient in histone demethylation. The Drosophila Utx gene has been previously implicated in catalyzing the removal of methyl groups from H3K27me3 (Smith et al., 2008); a null mutation, utxc499 (Supplementary file 2), displayed a further increase of H3K27me3 compared to age-matched WT (Figure 5E and I, Figure 5—figure supplement 1D). Flies lacking utx were viable, but detailed characterization indicated a significantly shortened lifespan, to about 70% that of WT animals (Figure 5J). Concomitant with an increase in H3K27me3 modification, expression of both Tpi and Pgi was further decreased (Figure 5K). Finally, control studies using short-lived miR-34 mutants (Liu et al., 2012) and a long-lived piwi deficiency that was identified from our unbiased genetic screen (Supplementary file 2) demonstrated that transcriptional changes of the glycolytic genes had no simple correlation with lifespan alterations (Figure 5—figure supplement 1E and F). Altogether, these data reveal that H3K27me3 dynamics with natural aging couples with a downregulation of glycolytic genes, and this reduction is enhanced in utx mutants upon further increase of H3K27me3. Long-lived PRC2 mutants partially reverse the decline in the expression of glycolytic genes that are otherwise significantly decreased with age. To further investigate the mechanism by which epigenetic changes regulate aging, we conducted another unbiased study by profiling cellular metabolites using LC-MS-based untargeted metabolomics (Patti et al., 2012). In total, 151 metabolites were identified. This experiment demonstrated changes in the levels of metabolites during aging of WT flies, and between WT and mutants (Figure 6A and C, Figure 6—figure supplement 1A). Pathway analysis revealed that glycolysis among additional metabolic processes was significantly enriched (Figure 6B and D). In particular, lactate, a specific indicator for anaerobic glycolysis (Schurr and Payne, 2007), was significantly decreased during normal aging in WT animals but became elevated in PRC2 mutants (Figure 6E). Of note, metabolites related to citric acid cycle remained unchanged between WT and mutants (Figure 6—figure supplement 1B). Combined, this evidence reveals a metabolic profile reflective of modulated glycolysis, being decreased during normal aging but increased in long-lived PRC2 mutants. Thus, this unbiased study using metabolomic approach showed modulation in the level of lactate and glycolysis during aging and in PRC2 mutants, in good congruence with the conclusion from the studies of epigenomic and transcriptional alterations (Figure 5—figure supplement 1C and D). Metabolomics shows the effect of PRC2 mutants in reversing glycolytic decline in aging. (A) Untargeted metabolics identifies that metabolites of the glycolytic pathway (red) are decreased with age. For each metabolite, the median from 10 biological repeats was used to calculate the relative fold change between WT and mutants. Untargeted metabolics was from head tissues of 3d- and 30d-old male flies. Genotype: 5905. (B) Pathway enrichment analysis reveals glycolysis being the biological processes significantly enriched with age. Pathway enrichment analysis was executed using MetaboAnalyst. (Pathway enrichment criteria: wilcoxon rank-sum test, cutoff p<0.01; see Materials and methods for algorithm). Genotype as in (A). (C) Untargeted metabolics identifies that metabolites of the glycolytic pathway (red) are increased in PRC2 mutants. Untargeted metabolics and analysis as in (A). Genotypes: WT: 5905. Mut: Pclc421/+; Su(z)12 c253/+. (D) Pathway enrichment analysis reveals glycolysis being the biological processes significantly enriched. (Pathway enrichment criteria: wilcoxon rank-sum test, cutoff p<0.01; see method for algorithm). Genotype as in (C). (E) Lactate is decreased with age (left panel) but increased in PRC2 mutants (right panel). (mean ±SD of 10 biological repeats; wilcoxon rank-sum test). Genotypes: WT: 5905. Pclc421/+; Su(z)12 c253/+. (F) Schematic representation of the glucose flux via glycolysis (left) and citric acid cycle (right). 13C and 12C were indicated for specific metabolites. Dashed rectangles encircled isotopologues pertaining to specific metabolites that contained different number of 13C. (G) Decline of glycolytic metabolites during aging is partially rescued by PRC2 deficiency. For specific metabolite, the median from eight biological repeats was used to calculate the ratio between 8d and 30d of age. (mean ±SD of eight biological repeats; wilcoxon rank-sum test). Metabolomics was from head tissues of 8d- and 30d-old male flies. Genotypes: WT: 5905. Pclc421/+; Su(z)12 c253/+. (H) Age-associated decline of glycolysis is diminished by PRC2 deficiency. 13C-traced glycolytic metabolites were used to determine the level of glycolytic pathway as a whole. In 30d WT, 50.1% of glycolysis remained as relative to its level at 8d of age; in contrast, in PRC2 mutants at 30d of age, 78% of glycolysis remained. (mean ±SD of eight biological repeat; see method for calculation). Metabolomics and genotypes as in (G). To provide quantitative insights into the changes in glucose metabolism with age and in PRC2 mutants, we devised a metabolic flux assay using 13C-labeled glucose as a tracer in adult aging flies. For young (3d) and aged (25d) animals, fly diet was switched from 12C-glucose to 13C-glucose, such that the glucose metabolism can be traced by measuring the 13C-labeled metabolites (Figure 6F, Figure 6—figure supplement 2A). After 5 days of feeding, 13C-labeled glucose accounted for more than 93% of the total glucose pool (Figure 6—figure supplement 2B), suggesting a near-complete replacement. This experiment demonstrated that while the level of labeled glucose was similar (Figure 6—figure supplement 2C), specific metabolites (Figure 6G) and the glycolytic pathway as a whole (Figure 6H) exhibited an age-associated decline; strikingly, the extent of decline was partially reversed by PRC2-deficiency. This finding, together with above results obtained by untargeted metabolomics, provides definitive evidence that glycolysis is modulated by aging. Since metabolites of the citric acid cycle are mix lineages from glycolysis, glutamate, and fatty acids, each metabolite may contain multiple 13C-labeled isotopologues via glycolysis-derived reactions as well as recurrent cycling (Figure 6F). Thus, we analyzed all isotopologues pertaining to each metabolites (Figure 6—figure supplement 2D) and their summed intensity (Figure 6—figure supplement 2E). Our data indicated no consistent change of the citric acid cycle with age and in PRC2-deficiency, which was in line with constant levels of metabolites as above measured by untargeted metabolomics (see Figure 6—figure supplement 1B). These data combined establish a regulatory event from epigenetic alterations to transcriptional and metabolic modulations impacting the manner by which glucose can be metabolized during aging and in PRC2 mutants. While natural aging couples with to a metabolic decline including a reduction of glycolysis, PRC2 deficiency relatively maintains the level of glycolysis as compared to age-matched WT animals. We next characterized specific metabolites in the glycolytic pathway. While anaerobic glycolysis yields ATP only, glycolysis at the step of pyruvate formation has a net outcome of both ATP and NADH, a reduced form of nicotinamide adenine dinucleotide (NAD+) (see Figure 5—figure supplement 1C). While the overall glucose levels between WT and mutants had no significant difference (Figure 7A), pyruvate was increased in mutants (Figure 7A). On the other hand, the ratio of NADPH/NADP+, an indicator of the PPP, foliate metabolism, and malic enzyme (Fan et al., 2014) was even slightly decreased in mutants (Figure 7B). In parallel, we also examined the glutathione, an important indicator of the cellular redox state (Jones, 2006). Our data showed that ATP, NADH/NAD+, and GSH/(GSH +GSSG) ratio were decreased with age but increased in mutants (Figure 7C and D). Combined, analysis of specific metabolites demonstrates a metabolic decline associated with normal aging, and that PRC2 deficiency promotes ATP and cellular redox potential as compared to age-matched WT controls. PRC2 mutants couple enhanced glycolysis with improved adult fitness. (A) Glucose content shows a slight increase in PRC2 mutants, but this increase is not statistically significant (left panel). Pyruvate, one key end product of glycolysis, is increased (right panel). (mean ±SD of three biological repeats with 10 flies for each measurements; student t-test; n.s. : not significant). Test was from muscle tissues of 30d-old male flies. Genotypes: WT: 5905. Mut: Pclc421/+; Su(z)12 c253/+. (B) The ratio of NADPH/NADP+, indicator of the PPP, foliate metabolism, and malic enzyme is decreased in mutants. Test, statistics, and genotype as in (A). (C) ATP and cellular redox levels are decreased with age. (mean ±SD of three biological repeats with 10 flies for each measurements; student t-test). Test was from muscle tissues of 3d- and 30d-old male flies. Genotype: 5905. (D) ATP and cellular redox levels are increased in PRC2 deficient animals. Test, statistics, and genotype as in (A). (E) and (F) Analysis of adult phenotypes reveals that PRC2 mutants have a healthy lifespan. Climbing assay exhibited that, whereas WT and mutants behaved similarly at 3d, with age, mutants had better climbing, reflective of improved mobility (E). Mutants had enhanced resistance to oxidation (F). (for climbing assay: mean ±SD of 10 biological repeats with 10 flies for each repeats; student t-test; for oxidation tests: 25°C; n = 100 per genotype for curve; log-rank test). Genotypes as in (A). We then asked how this ability of enhanced glycolysis in PRC2 mutants was translated into fitness and stress resistance in aging. To illuminate this, we characterized age-related phenotypes. Analysis of climbing of young (3d) and aged (30d) animals demonstrated that although WT and mutants at 3d behaved similarly, PRC2 mutants at 30d of age had better locomotion (Figure 7E). To examine the sensitivity to oxidative stress, we utilized hydrogen peroxide (H2O2), a source of reactive oxygen species (ROS). We observed substantially enhanced resistance to oxidation in mutants (Figure 7F). Elevated energy and NADH/NAD+ ratio in PRC2 mutants might underlie improved motility and resistance to ROS, respectively. These data implicate that PRC2-deficiency couples longevity and metabolism with enhanced ability to handle stress, a property reflecting improved adult fitness. We subsequently determined whether perturbing glycolysis could diminish the lifespan benefits of PRC2 mutants. In PRC2 mutants, Tpi and Pgi were two genes exhibiting a concerted decrease in H3K27me3 modification (see Figure 5E, Figure 5—figure supplement 1D) and a corresponding increase in transcription (see Figure 5G, Figure 5—figure supplement 1C); thus Tpi and Pgi might be important targets of PRC2. In light of this, we generated a null mutation of the Tpi gene by CRISPR/Cas9, Tpic511 (Supplementary file 2). Tpi gene, encoding triosephosphate isomerase, is a central glycolytic enzyme (Bar-Even et al., 2012). Given homozygous Tpic511 had a pre-adult lethality, we combined Tpic511 heterozygote with Pclc421 Su(z)12c253, and evaluated the adult phenotypes by using the triple mutants. Control studies indicated that the Tpic511 heterozygote alone retained normal lifespan (Figure 8—figure supplement 1A), oxidative stress (Figure 8—figure supplement 1B), locomotion (Figure 8—figure supplement 1C), and comparable levels of ATP and NADH/NAD+ ratio (Figure 8—figure supplement 1D). 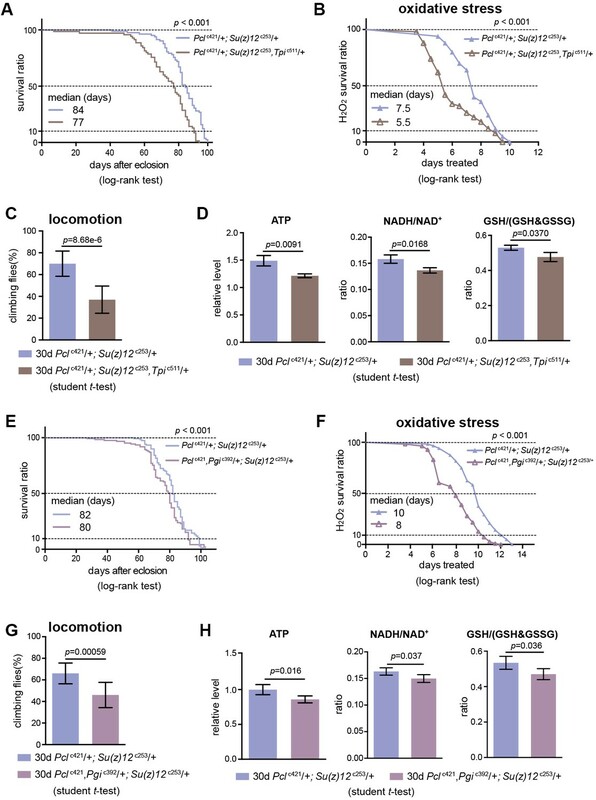 Lowering Tpi in PRC2 mutants slightly decreased the expression of Tpi gene (Figure 8—figure supplement 1E) and diminished the extent by which glycolysis could be stimulated as having relatively reduced ATP and NADH/NAD+ ratio (Figure 8D). Analysis of lifespan exhibited that Tpi deficiency partially mitigated the longevity phenotype in PRC2 mutants (Figure 8A). Traits related to adult fitness, including resistance to ROS and climbing mobility, were also attenuated by Tpi deficiency (Figure 8B and C). To consolidate this result, we generated a null mutation for Pgi by CRISPR/Cas9, Pgic392 (Supplementary file 2). 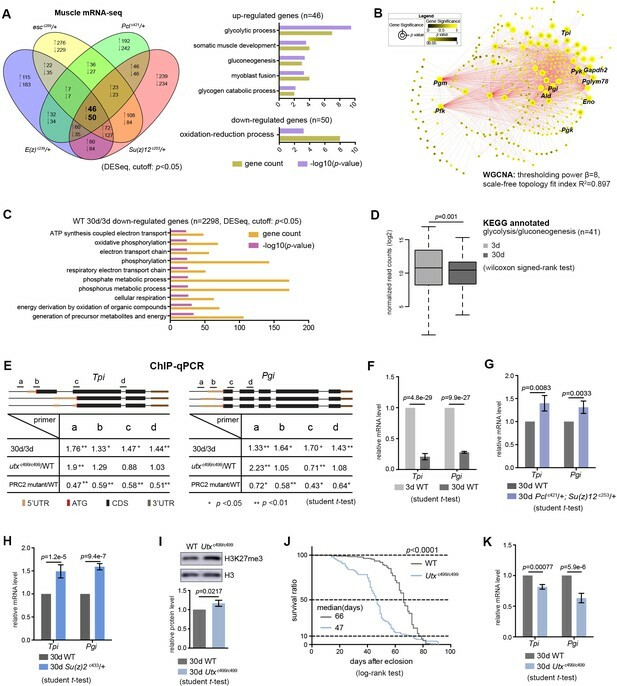 Consistently, while Pgic392 heterozygote alone had minimal effect on aging (Figure 8—figure supplement 1F–1I), triple mutants combining Pgic392 heterozygote with Pclc421 Su(z)12c253 diminished the pro-lifespan benefits mediated by PRC2-deficiency (Figure 8E–8H, Figure 8—figure supplement 1J). 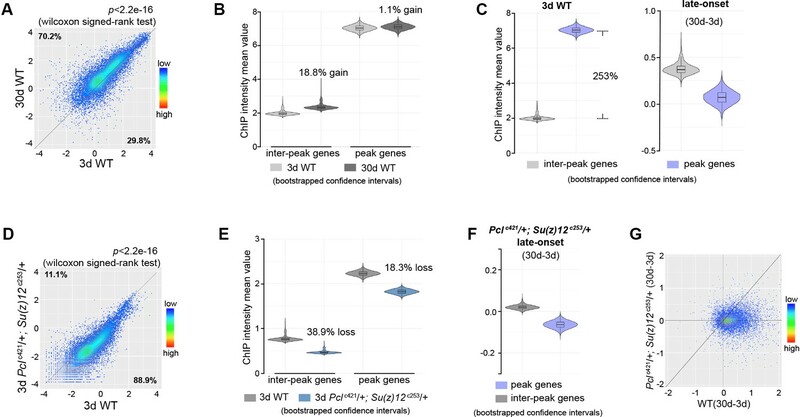 These data implicate that perturbing glycolysis by genetic mutation diminishes longevity traits in PRC2 Mutants. Given the effect is partial, we cannot rule out the possibility that other mechanisms might be involved. 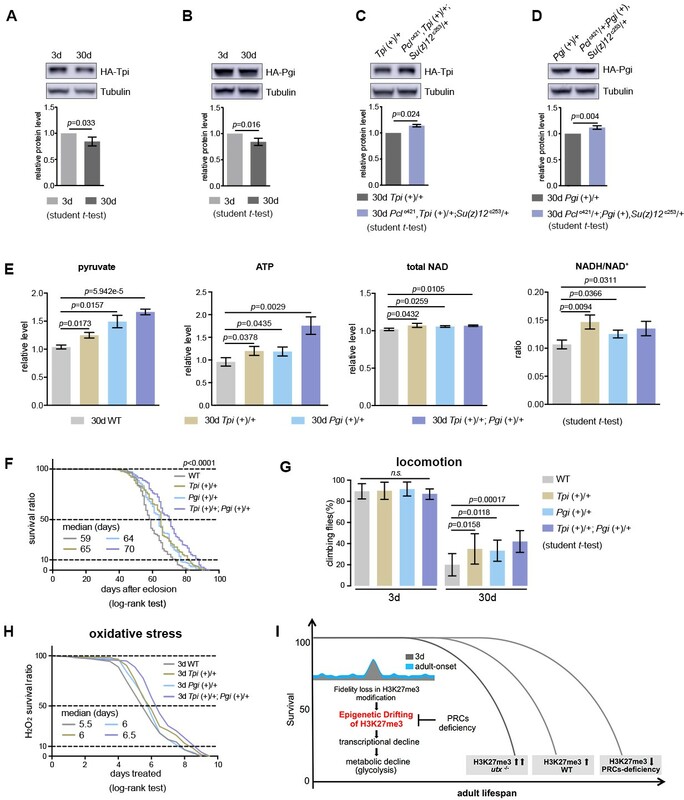 Perturbing glycolysis diminishes longevity benefits in PRC2 mutants. (A) Tpi deficiency significantly diminishes the longevity phenotype of PRC2 trans-heterozygous double mutants. (for lifespan assay: 25°C; n > 200 per genotype; log-rank test). Genotypes: Pclc421/+; Su(z)12 c253/+. Pclc421/+; Su(z)12c253, Tpic511/+. (B) and (C) Oxidation stress test (B) and climbing (C) show that Tpi deficiency partially diminishes the lifespan-benefits of PRC2 mutants. (for oxidation assay: 25°C; n = 100 per genotype for curve; log-rank test; for climbing assay: mean ±SD of 10 biological repeats with 10 flies for each repeat; student t-test). Genotypes as in (A). (D) Tpi deficiency reduces glycolysis of PRC2 mutants. Analysis of specific metabolites revealed a decrease of ATP (left panel), ratio of NADH/NAD+ (middle panel), and ratio of GSH/(GSH +GSSG) (right panel). (mean ±SD of three biological repeats; student t-test). Metabolite analysis was from muscle tissues of 30d-old male flies. Genotypes as in (A). (E–H) Pgi deficiency diminishes the aging benefits mediated by PRC2 mutants, including lifespan (E), oxidative stress (F), locomotion (G), and glycolysis (H). Genotypes: Pclc421/+; Su(z)12 c253/+. Pclc421, Pgic392/+; Su(z)12 c253/+. Our data thus far have shown the effect of glycolysis in PRC2-dependent life-benefits. Furthermore, we investigated whether upregulating glycolytic genes in WT animals could be sufficient to extend lifespan. To address this, we increased the gene dosage of Tpi and Pgi via genomic transgenes, which expressed these genes under their endogenous regulatory elements (Figure 9—figure supplement 1A and B). Western blot analysis manifested that both Tpi and Pgi proteins had a modest decrease with age, but became upregulated upon PRC2-deficiency, an outcome consistent with the alteration in the level of H3K27me3 (Figure 9A–9D). We then interrogated the effects of Tpi and Pgi transgenes on WT flies. While single transgenes had modest phenotypes, animals combining both Tpi and Pgi transgenes stimulated glycolysis, as shown by elevated pyruvate, ATP, and NADH/NAD+ ratio as compared to age-matched WT (Figure 9E). Accordingly, adult aging phenotypes, including lifespan (Figure 9F), locomotion (Figure 9G), and resistance to oxidative stress (Figure 9H), were improved. Transgenic increase of glycolytic genes suffices to elevate glycolysis and healthy lifespan. (A) Tpi protein western blot (top) and quantification (bottom) shows a decrease with age. (mean ±SD of three biological repeats; student t-test). Western blot was from 3d- and 30d-old male flies. Genotype: Tpi (+)/+. (B) Pgi protein western blot (top) and quantification (bottom) shows a decrease with age. Statistics and Western blot as in (A). Genotype: Pgi (+)/+. (C) Tpi protein western blot (top) and quantification (bottom) shows an increase in PRC2 mutants. Statistics and western blot as in (A). Genotype: Tpi (+)/+. Pclc421, Tpi (+)/+; Su(z)12 c253/+. (D) Pgi protein western blot (top) and quantification (bottom) shows an increase in PRC2 mutants. Statistics and western blot as in (A). Genotype: Pgi (+)/+. Pclc421/+; Pgi (+), Su(z)12 c253/+. (E) Transgenic increase of glycolytic genes stimulates glycolysis, as shown by elevated pyruvate, ATP, and NADH/NAD+ ratio compared to age-matched WT (mean ±SD of three biological repeats; student t-test). Metabolite analysis was from muscle tissues of 30d-old male flies. Genotypes: WT: 5905. Tpi (+)/+. Pgi (+)/+. Tpi (+)/+; Pgi (+)/+. (F–H) Transgenic increase of glycolytic genes promotes adult fitness, including lifespan (F), locomotion (G), and resistance to oxidative stress (H). (for lifespan assay: 25°C; n ≥ 200 per genotype for curve; log-rank test; for climbing assay: mean ±SD of 10 biological repeats with 10 flies for each repeat; student t-test; for oxidation assay: 25°C; n = 100 per genotype for curve; log-rank test). Genotypes as in (E). (I) Model. Adult-onset fidelity loss results in epigenetic drift of H3K27me3. Over a chronic timescale, the drifting of H3K27me3 induces transcriptional and metabolic decline including a reduction of glycolysis. Effects of PRC2-deficiency in life-extension can be at least in part attributed to the effect in stimulation of glycolysis, thereby maintaining metabolic health and longevity. Adult lifespan is inherently modulated by the alterations in the levels of H3K27me3, as shown by the corresponding change during natural aging, in utx mutants as well as in PRCs-deficiency. Taken together, these data suggest that upregulation of glycolytic genes alone recapitulates antiaging features of PRC2 mutants. This finding, combined with data obtained from H3K27me3 dynamics and consequently its effects on gene expression and metabolism, underscores the mechanistic link between epigenetic, transcriptional, and metabolic processes in aging, further heightening the role of glycolysis in promotion of metabolic health and longevity. How changes in epigenomics, transcription, and metabolomics are integrated into the regulation of adult lifespan is a long-standing question in the biology of aging. Our study provides a new paradigm by which epigenetic drift of H3K27me3, a highly conserved histone mark, links glycolysis to healthy longevity (Figure 9I). Though H3K27me3 levels have been shown to increase with age in mammals (Liu et al., 2013; Sun et al., 2014) and flies (current study), the epigenomic feature of such changes is unknown. Our quantitative assessment shows that aging couples with a decline of fidelity in H3K27me3 modification, as demonstrated by a genome-wide drift of this repressive mark. Concomitant to this drift, glycolytic genes are downregulated, which in turn causes a reduction of glycolysis and glucose metabolism. Importantly, the age-delaying effect of PRCs-mutation likely arises from its ability to slow down or reverse this trend. Therefore, we suggest that epigenetic drift of H3K27me3, enhanced by its age-modulated increase, is one of the molecular mechanisms that drive the progression of aging. Expression of Tpi and Pgi of glycolytic genes is inherently regulated by the alterations of H3K27me3 levels, as shown by their corresponding changes during natural aging, in utx mutants as well as in PRCs-deficiency. We propose that H3K27me3 dynamics may elicit changes in local chromatin environment—especially inter-peak regions that are potentially more sensitive to the gain or loss of the epigenetic mark—thus enabling fine-tuning of target gene expression. It is unclear how aging might promote the drift in H3K27me3 modification. One possible reason is age-associated DNA damage that reduces the fidelity of epigenetic markings. It has been well-established that aging is associated with the accumulation of DNA damage (Lu et al., 2004). In Bombyx mori, UV-C irradiation can induce the increase of H3K27me3 mediated by PRC2 (Li et al., 2014). In Neurospora crassa, on the other hand, the increase and redistribution of H3K27me3 can be induced by the loss of H3K9 methyltransferase complex (Basenko et al., 2015). Thus, dysregulation of H3K27me3 may be due to feed-forward interactions between DNA damage and changes in the levels of complexes that control epigenetic markings during aging. Metabolic control has emerged as a critical player to determine the aging outcome. Previous data implicates that impairing glycolysis can extend lifespan perhaps by triggering compensatory processes (Schulz et al., 2007). Quantitative proteomic analysis in mouse heart shows that aging correlates with an increased abundance of proteins in glycolysis, and that caloric restriction and rapamycin treatment known to extend longevity can reverse this trend (Dai et al., 2014). D-Glucosamine supplementation that impairs glucose metabolism can extend lifespan in C. elegans and mouse (Weimer et al., 2014). However, rat models supplemented with 2-deoxyglucose, a known anti-glycolytic compound, are instead short-lived (Minor et al., 2010). Moreover, glucose-enriched diet can prevent pathophysiological decline and early death of telomere dysfunctional mice by stimulating glucose metabolism including glycolysis (Missios et al., 2014). Importantly, recent evidence from studies on a wide range of species suggests that a balanced diet from protein to carbohydrate and their interactive effects are key elements for healthy longevity. Mouse dietary studies have demonstrated that animals fed on diets that are low in protein and high in carbohydrate enjoy longer life with lower blood pressure, improved glucose tolerance and lipid profiles (Solon-Biet et al., 2014). This is also supported by human data on the deleterious effects of diets with high protein and low-carbohydrate (Floegel and Pischon, 2012; Lagiou et al., 2012). Hence, the impact of glucose metabolism including glycolysis on natural aging might be poised to integrate age-associated physiology; the precise outcome must be rather complicated, which could be influenced not only by diverse spatiotemporal need in normal or pathological conditions, but also upon newly evolved biological activities correlated with the increased complexity from nematode to Drosophila and mammals. It is important to note that since our study is based on Drosophila somatic tissues that are primarily post-mitotic cells in adult animals, it is possible that the effects are more dominant in the fly model than others. Our findings in Drosophila propose that, during natural aging, the ability to maintain glycolysis is an alternative avenue to ensure a healthy level of physical capability by delaying the bioenergetic decline with advanced age as which otherwise might form a vicious cycle from decrease in physical activity to hypometabolism, and perhaps disease susceptibility. Aging is a complex process that can be regulated by a network of multiple mechanisms. It has been well-established that enhancing NAD+ biogenesis promotes healthy lifespan (Anderson et al., 2002; Balan et al., 2008; Mills et al., 2016). As noted, supplementation of NAD+ precursors profoundly elevates energy metabolism by increasing the expression of genes in the TCA cycle as well as glycolysis in C. elegans (Mouchiroud et al., 2013), and promotes glucose metabolism with increased flux through pentose phosphate and glycolytic pathways in mice on a high-fat diet (Mitchell et al., 2018). Therefore, it would be interesting to test whether the life-benefit effects of NAD+ might be through at least in part by the activation of glycolysis. 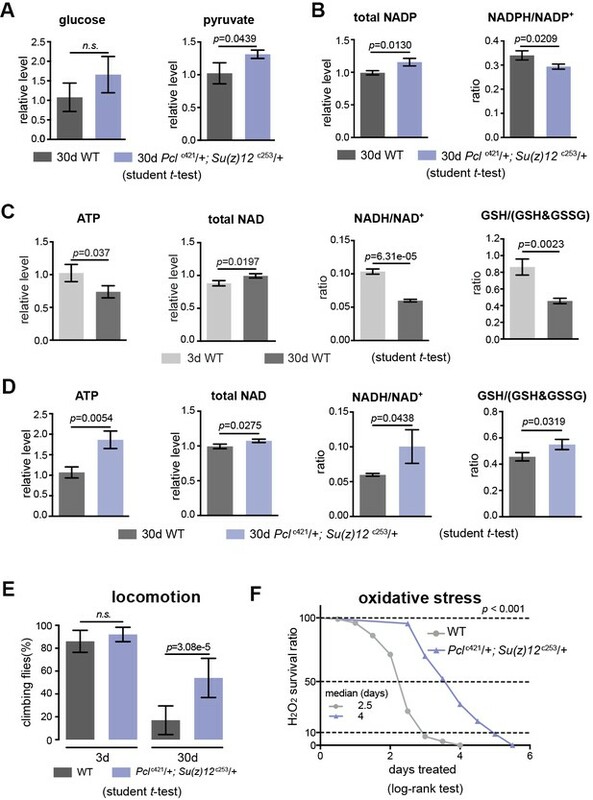 Intriguingly, while declining intracellular NAD+ and thus increased NADH/NAD+ ratio correlate with aging (Zhu et al., 2015), our experiments in Drosophila demonstrate that increased ratios of GSH/(GSH +GSSG) and NADH/NAD+ due to enhanced glycolytic activities may provide a simple but effective way to retard aging. The oxidative phosphorylation, although produces more ATP than glycolysis, can yield intracellular ROS. The accumulation of ROS is the leading proposed cause of decline in cellular function and integrity in aging (Balaban et al., 2005). Thus, modulating H3K27me3 may reprogram bioenergetic decline during aging, which in effect reduces cellular damage and deterioration. Importantly, mammalian glycolytic genes have also been shown as PRCs targets (Brookes et al., 2012). Future investigations, including in-depth comparative analysis of PRCs and glycolytic pathway in the aging process in both flies and humans, may harness common operative mechanisms that modulate metabolic homeostasis and healthy longevity. Given the reversible nature of epigenetic pathways, this study proffers a tempting strategy against age-associated physiological decline and disease. Flies were cultured in standard media at 25°C with 60% humidity in a 12 hr light and 12 hr dark cycle unless otherwise specified. Briefly, standard Drosophila food contains sucrose (36 g/L), maltose (38 g/L), yeast (22.5 g/L), agar (5.4 g/L), maizena (60 g/L), soybean flour (8.25 g/L), sodium benzoate (0.9 g/L), methyl-p-hydroxybenzoate: (0.225 g/L), propionic acid (6.18 ml/L), and ddH2O to make up 1 L of the food. The WT line used was 5905 (FlyBase ID FBst0005905, w1118). All fly lines used in this study have been backcrossed with 5905 for five consecutive generations for a uniform genetic background, to assure that phenotypes were not associated with any variation in background. Fifty heads or 30 muscles were harvested and immediately frozen in liquid nitrogen. Tissues were homogenized by Dounce Homogenizer. For total protein extract, tissues were lysed by RIPA buffer and then treated with five cycles of sonication with 30 s on and 30 s off (Bioruptor Pico, Belgium). Resulted histone extractions were loaded onto a NuPAGE 12% Bis-Tris Gel (Thermo Fisher Scientific, Carlsbad, CA, USA), and then transferred by electrophoresis to a polyvinylidene fluoride membrane (Millipore, Germany). The corresponding primary antibodies were diluted 1:1000 and incubated with the membranes at 4°C overnight, the HRP-labeled secondary antibodies were diluted 1:40000 and incubated for 1 hr at room temperature. The signals were detected using ECL (Thermo Fisher Scientific) by Amersham Imager 600 (GE Healthcare, Sweden). The signal intensity was quantified by ImageQuant TL (GE Healthcare). The relative normalization of histone modifications was normalized to the histone H3 signal. Three biological replicates were done for each experiment. CRISPR/Cas9 mutagenesis was performed as previously described (Ren et al., 2013). Two sgRNA plasmids for target gene were injected into fly embryo. Single-fly-PCR assays were used to screen mutants. To do this, single fly was homogenized in 50 μL squashing buffer (10 mM Tris buffer (pH 8.5), 25 mM NaCl, 1 mM EDTA, 200 μg/mL Proteinase K), then incubated at 37°C for 30 min, followed by 95°C, 10 min for inactivation. Screen primers for each target genes were listed in Supplementary file 2. The virgin females carrying the deletion were backcrossed into WT (5905) male flies for five consecutive generations for a uniform genetic background, to mitigate background effects. Genomic DNA covering the Tpi and Pgi genes was prepared by PCR-amplification and fusion PCR. DNA was clone into the pBID vector (Wang et al., 2012). Fly microinjection and transgenesis followed standard procedures. Metabolic flux analyses are described in more detail at Bio-protocol (Cai et al., 2018). 160 male flies for each genotype at 3d or 25d of age were used, with 20 flies per vial. Prior to the test, flies were pre-treated with 1% Agar media for 6 hr before transferred to the vials containing a small piece of Kimwipe filter paper pre-soaked in 1 mL of 10% U-13C6-glucose. Flies were treated for 3 days, and then transferred to new vials with fresh U-13C6-glucose for additional 2 days. Fly heads were dissected for subsequent metabolic analysis. For each genotype, eight biological repeats were conducted, with 20 heads for each repeats. Adult male flies were collected at the day of eclosion and maintained at 20 flies per vial at 25°C with 60% humidity and a 12 hr light/12 hr dark cycle. Flies were transferred to new vials every other day and scored for survival. The Prism software (Graphpad) was used to draw the survival curve and statistical analysis. Ten male flies were transferred to an empty vial for 30 min adaption in dark. Flies were tapped to the bottom of the vial; the percentage of flies failed to climb up to a mark at 2 cm from the bottom within 5 s was scored. Ten biological replicates were done for each genotype at given age. One hundred male flies for each genotype at given age were used, with 20 flies per vial. Prior to the test, flies were pre-treated with 1% Agar media for 6 hr before transferred to the media containing oxidative radical species. For H2O2 treatment, flies were transferred to vials containing a small piece of Kimwipe filter paper pre-soaked in 1.5 ml of 10% glucose and 2% H2O2 (Sinopharm Chemical Reagent). Dead flies were scored every 12 hr, and the Prism software (Graphpad) was used to generate the survival curve and statistical analysis. Quantitative ChIP-seq analyses are described in more detail at Bio-protocol (Niu et al., 2018). For developmental stages, embryo (30 min-1 hr), larva (96 hr), and pupae (7d) were analyzed. For adult stage, 100 fly muscles and 200 fly heads at each time point were used. Samples were collected into a 1.5-mL microcentrifuge tube and immediately frozen in liquid nitrogen. Tissues were pulverized to fine powder using a liquid nitrogen cooled mortar and pestle. Resulted fine power was resuspended in 1.2 mL PBS; 32.4 μL of 37% formaldehyde was added for cross-linking at room temperature for 10 min. To quench formaldehyde, 60 μL of 2.5 M glycine was added. Centrifugation was using 5000 g for 5 min at 4°C. After removing the supernatant, pellet was washed twice with 1 ml PBS containing proteinase inhibitor (Roche). This lysis step was performed at 4°C for more than 1 hr in RIPA buffer (Sigma) supplemented with proteinase inhibitor. The lysate was sonicated using Bioruptor Pico (Diagenode), for 15 cycles with 30 s on and 30 s off. Centrifugation was using 10,000 g for 10 min at 4°C. Supernatant was carefully transferred to a new tube without disturbing the debris. Pre-clear was performed using ChIP-Grade Protein A/G Plus Agarose (Thermo Fisher Scientific) at 4°C for 1 hr. For spike-in epigenome, mouse neuro-2a cells were prepared with the same procedures. Prior to mixing mouse epigenome with that of fly’s, 5% from each preparations was transferred for quantification of DNA mass. To do this, RIPA buffer was added to a final volume of 120 μl, followed by 1 μl RNase A to remove the RNA at 37°C for 30 min. Samples were treated with 0.2 M NaCl (final concentration) at 65°C for 4 hr and 200 ng/μl proteinase K (final concentration) at 55°C for 2 hr. DNA was purified by PCR purification kit (Qiagen), and DNA mass was quantified by Qubit dsDNA HS assay kit (Thermo Fisher Scientific). According to the DNA mass, 5% of the mouse epigenome was added to the fly sample. 10% of sample was transferred to a new tube as ChIP input control. Immunoprecipitation was performed by incubating 3 μg antibody at 4°C for 5 hr with rotation. ChIP-Grade Protein A/G Plus Agarose was added. The sample was incubated overnight at 4°C with rotation. Beads were washed twice with ChIP Wash Buffer (150 mM NaCl, 2 mM EDTA (pH8.0), 20 mM Tris- HCl (pH8.0), 1% Triton X-100, and 0.1% SDS), and another two washes using ChIP Final Wash Buffer (500 mM NaCl, 2 mM EDTA (pH8.0), 20 mM Tris-HCl (pH8.0), 1% Triton X-100, and 0.1% SDS). The elution step was using 120 μL of ChIP Elution Buffer (100 mM NaHCO3 and 1% SDS) by incubating at 65°C for 30 min. Resulted DNA was purified as above described, followed by RNase A treatment. 5–10 ng of DNA was used to generate sequencing library using NEB DNA library prep kit. The quality of libraries was checked by Bioanalyzer 2100 (Agilent). The quantification was performed by qRT-PCR with a reference to a standard library. The libraries were pooled together in equimolar amounts to a final 2 nM concentration. The normalized libraries were denatured with 0.1 M NaOH (Sigma). Pooled libraries were sequenced on the illumina Miseq/Next-seq platform with single end 100 bps. Thirty muscles and fifty heads were dissected and homogenized in a 1.5-mL tube containing 1 mL of Trizol Reagent (Thermo Fisher Scientific). RNA isolation was followed in accordance with manufacturers instruction. RNA was resuspended in DEPC-treated RNase-free water (Thermo Fisher Scientific). TURBO DNA-free kit was used to remove residual DNA contamination according to manufacturers instruction (Thermo Fisher Scientific). 1 μg of total RNA was used for sequencing library preparation. PolyA-tailed RNAs were selected by NEBNext Poly(A) mRNA Magnetic Isolation Module (NEB), followed by the library prep using NEBNext Ultra RNA library Prep Kit for Illumina according to manufacturer’s instruction (NEB). The libraries were checked and pooled as described above. Pooled denature libraries were sequenced on the illumina NextSeq 550 or Hiseq 2500 platforms with single end 100 bps. ChIP experiments were performed as described above. The same volume of input and IP DNA were used as template for quantitative PCR experiment. Analysis was performed using the QuantStudio 6 Flex real-time PCR system with SYBR selected master mix (Thermo Fisher Scientific). The percentage of input method was used for data analysis. Primers for target genes were listed in Supplementary file 5. RNA extractions were done as described above. 1 μg of total RNA was used for reverse transcription by random primers using SuperScript III First-strand synthesis system for RT-PCR (Thermo Fisher Scientific). Analysis was performed using the QuantStudio 6 Flex real-time PCR system with SYBR selected master mix (Thermo Fisher Scientific). The 2-ΔΔCT method was used for quantification upon normalization to the RP49 gene as internal control. Primers for target genes were listed in Supplementary file 5. Twenty heads for each replicates were collected into a microcentrifuge tube and immediately frozen into liquid nitrogen. For each experiment, 10 biological replicates were prepared. Fly heads were homogenized with 200 μl of H2O and 20 ceramic beads (0.1 mm) using the homogenizer (Precellys 24, Bertin Technologies). 800 μl of ACN:MeOH (1:1, v/v) was added for metabolite extraction. Vortex was for 30 s, followed by incubation in liquid nitrogen for 1 min. This freeze-thaw cycle was repeated three times. To precipitate protein, samples were incubated for 1 hr at −20°C, followed by 15 min centrifugation using 15,000 g at 4°C. The supernatant was removed and evaporated to dryness in a vacuum concentrator (Labconco, German). Dry extracts were then reconstituted in 100 µl of ACN:H2O (1:1, v/v), followed by 10 min sonication (50 Hz, 4°C) and 15 min centrifugation using 13,000 rpm at 4°C to remove insoluble debris. Supernatants were transferred to HPLC glass vials and stored at −80°C prior to LC/MS analysis. LC-MS was performed using a UHPLC system (1290 series, Agilent Technologies) coupled to a quadruple time-of-flight mass spectrometer (AB Sciex TripleTOF 6600). Waters ACQUITY UPLC BEH Amide columns (particle size, 1.7 μm; 100 mm (length) ×2.1 mm (i.d.)) were used. Mobile phases A = 25 mM ammonium acetate and 25 mM ammonium hydroxide in 100% water, and B = 100% acetonitrile, were used for both ESI positive and negative modes. And the linear gradient eluted from 95% B (0.0–1.0 min), 95% B to 65% B (1.0–14.0 min), 65% B to 40% B (14.0–16.0 min), 40% B (16.0–18.0 min), 40% B to 95% B (18.0–18.1 min), then stayed at 95% B for 4.9 min. The flow rate was 0.3 mL/min and the sample injection volume was 2 μL. ESI source parameters on TripleTOF 6600 were set as followings: ion source gas 1 (GS1), 60 psi; ion source Gas 2 (GS2), 60 psi; curtain gas (CUR), 30 psi; temperature (TEM), 600°C; ion spray Voltage floating (ISVF), 5000 V or −4000 V, in positive or negative modes, respectively; declustering potential (DP), 60 V or −60 V in positive or negative modes, and collision energy for Product Ion, 30 eV or −30 eV, in positive or negative modes, respectively; collision energy spread (CES), 0 eV. LC-MS/MS data acquisition was operated under information-dependent acquisition (IDA) mode. The instrument was set to acquire over the m/z range 60–1200 Da for TOF MS scan and the m/z range 25–1200 for product ion scan. The accumulation time for TOF MS scan was set at 0.20 s/spectra and product ion scan at 0.05 s/spectra. The unit resolution was selected for precursor ion selection, and the collision energy (CE) was fixed at 30 V and −30 V for positive or negative modes, respectively. Collision energy spread (CES) was set as 0. IDA settings which were set as followings: charge state 1 to 1, intensity 100 cps, exclude isotopes within 4 Da, mass tolerance 10 ppm and maximum number of candidate ions 6. The ‘exclude former target ions’ was set as 4 s after two occurrences. In IDA Advanced tab, ‘dynamic background subtract’ was also chosen. Metabolites were extracted as described above for untargeted metabolomics. LC-MS analysis was performed using a UHPLC system (1290 series, Agilent Technologies) coupled to a quadruple time-of-flight mass spectrometer (6550 series, Agilent Technologies). Merck SeQuant ZIC-pHILIC column (particle size, 5 μm; 100 mm (length) ×2.1 mm (i.d.)) was used. Mobile phases A = 25 mM ammonium acetate and 25 mM ammonium hydroxide in 100% water, and B = 100% acetonitrile, were used for both ESI positive and negative modes. And the linear gradient eluted from 80% B (0.0–2.0 min, 0.2 mL/min), 80% B to 20% B (2.0–17.0 min, 0.2 mL/min), 20% B to 80% B (17.0–17.1 min, 0.2 mL/min), 80% B (17.1–22.1 min, 0.4 mL/min), 80% B to 80% B (22.1–22.2 min, 0.2 mL/min). The sample injection volume was 2 μL. ESI source parameters on QTOF 6550 were set as followings: sheath gas temperature, 300°C; dry gas temperature, 250°C; sheath gas flow, 12 L/min; dry gas flow, 16 L/min; capillary voltage, 2500 V or −2500 V in positive or negative modes, respectively; nozzle voltage, 0 V; and nebulizer pressure, 20 psi. The MS1 data acquisition frequency was set as 4 Hz, and the TOF scan range was set as m/z 60–1200 Da. Data processing for qualitative metabolic flux analysis was performed using VistaFlux software suite from Agilent Technologies. First, Pathways to PCDL software (version B.07.00, Agilent Technologies) and PCDL Manager software (version B.07.00, Agilent Technologies) was used to build a metabolite library for metabolites in both glycolysis and citric acid cycle. Then, acquired LC-MS raw data files (.d) were loaded into Profinder (version B.08.00, Agilent Technologies) for the extraction of metabolite isotopologues using the constructed metabolite library. The ion abundance criterion for data extraction was set as ‘use peak core area 20% of peak height’. The qualification parameters were set as: mass tolerance: ±15 ppm +2.00 mDa; retention time tolerance :±0.20 min; anchor ion height threshold: 250 counts; sum of ion heights threshold: 1000 counts; correlation coefficient threshold: 0.5. The final results were exported into a csv file for the subsequent comparative and statistical analyses. Ten fly muscles were harvested and immediately frozen in liquid nitrogen. Tissues were homogenized using the homogenizer (Precellys 24, Bertin Technologies) with 300 μl ddH2O or extraction buffer provided by the kit. For glucose, ATP, GSH and pyruvate assays, tissues were homogenized with ddH2O, then frozen at −80°C for 30 min and thawed at room temperature, followed by 5 cycles of 30 s on and 30 s off sonication. For NADH and NADPH assays, tissues were homogenized with extraction buffer provided by the kit. Lysates were centrifuged using 10,000 g at 4°C for 5 min and the supernatant was transferred to 10 kDa molecular weight cut-off spin filter (Sigma), followed by centrifugation using 10,000 g at 4°C for 30 min for deproteinization. Assays were assembled according to the instruction of manufacturers (Glucose [Sigma, MAHK20], ATP [Promega, FF2000], GSH [Abcam, ab13881], pyruvate [Sigma, MAK071], NADH [Sigma, MAK037], NADPH [Sigma, MAK038]). Signals were detected by the EnSpire Multimode Plate Reader (PerKin Elmer). Sequencing reads were mapped to the reference genome dm6 or mm10, respectively, with Bowtie2-2.2.9 (Langmead and Salzberg, 2012) using default parameters. Samtools-1.3.1 (Li et al., 2009) was used for sam to bam format conversion. Peak regions were identified by homer-v4.8.3 (Heinz et al., 2010) function findPeaks with parameter ‘-style histone -F 2 -size 3000 -minDist 5000’. The overlapped peaks of replicate datasets were found using homer function mergePeaks using default parameter. Peak annotation was performed by homer function annotatePeaks with default parameter. The intersecting peak regions between different genotypes and aging stages were identified by BEDTools-2.26.0 (Quinlan and Hall, 2010) using default parameter. Let us define a as the normalized factor, b as the reference signal from the mouse cells, c as the total number of reads (in millions) from a sample aligned to mm10 genome, and d as the percentage of mapped spike-in mouse genome (genome build mm10) in input. The ChIP intensity for the gene bodies (transcriptional start site to transcriptional termination sites as annotated in dm6) of all protein-coding genes or peak region was calculated using the bwtool (Pohl and Beato, 2014) function summary with default parameters. The input bigwig file, normalized by a scale factor, was generated by bamCoverage function. Bootstrapping was used for calculating the mean reference-adjusted ChIP intensity of peak genes or inter-peak genes (10000 draws with replacement of n = 500) and the confidence intervals. Violin plots represent the bootstrapped mean H3K27me3 level of inter-peak genes and peak genes at different ages. The scatter plot and violin plot was generated by R package ggplot2. For visualization of the selected genome regions, we used IGV-2.3.31 (Robinson et al., 2011) with the bigwig files generated by bamCoverage. Circos plot was generated by J-circos-V1 (An et al., 2015) with the bigwig files. Cistrome correlation tools (Liu et al., 2011) were used to generate the heatmap with hierarchical clustering (hclust function in R) according to pair-wise correlation coefficients. Pair-wise Pearson correlations of genome-wide H3K27me3 levels were calculated at windows of 1Kbps on the genome scale using multiple bigwig file. The deeptools function bamCompare was used to generated bigwig file based on ChIP and input bam files that are compared to each other with ratio while being simultaneously normalized using RPKM. Sequencing reads were mapped to the reference genome dm6 with STAR2.3.0e (Dobin et al., 2013) by default parameter. The read counts for each gene were calculated by HTSeq-0.5.4e (Anders et al., 2015) htseq-count with parameters ‘-m intersection-strict -s no’ with STAR generated SAM files. The count files were used as input to R package DESeq (Anders and Huber, 2010) for normalization and the differential expression genes were differential expression genes were computed based on normalized count from three biological replicates (p<0.05). The venn diagrams of overlapped differential genes were generated by VENNY-2.1 (http://bioinfogp.cnb.csic.es/tools/venny/index.html). GO term analysis was performed by David (Huang et al., 2009a, Huang et al., 2009b) with default parameters. WGCNA (1.51) was used for network analysis of co-regulated genes across PRC2 mutant samples with parameters “Soft thresholding power β = 8; Scale-free topology fit index R2 = 0.897). For selected module, Cytoscape (3.5.1) was used for visualizing interaction network. The raw MS data (.wiff) were converted to mzML files using ProteoWizard MSConvert (version 3.0.6526) and processed using XCMS (Smith et al., 2006) for feature detection, retention time correction and alignment. Part of XCMS processing parameters were optimized and set as followings: mass accuracy in peak detection = 25 ppm; peak width c = (5, 20); snthresh = 6; bw = 10; minfrac = 0.5. R package CAMERA (Kuhl et al., 2012) was used for peak annotation after XCMS data processing. A customized R script was used to preprocess and extract the MS/MS data for database match with in-house library. The resulting raw data was then preprocessed for data normalization using SVR algorithm (Shen et al., 2016). Pathway enrichment analysis was executed using MetaboAnalyst 3.0 (Xia et al., 2015). In MetaboAnalyst 3.0, metabolic pathways for Drosophila melanogaster were selected. The pathway analysis algorithms were hypergeometric test for over representation analysis and relative-betweeness centrality for pathway topology analysis. For normalized intensity calculation, the preprocessed metabolomic data was further scaled (see below). Specifically, in each sample group, the pathway intensity was determined by calculating the sum of detected metabolites' normalized intensities in each metabolic pathway. The raw data files of sequencing experiments have been deposited in the NCBI Gene Expression Omnibus, as well as the normalized read density profiles of ChIP-seq and differential expression results from DESeq of RNA-seq reported in this paper. The accession number is GEO:GSE96654. All statistical details of experiments are included in figure legends. Sample numbers and experiment replicates are stated in figure legends. Journal of Biological Chemistry 277:18881–18890. Journal of Biological Chemistry 283:27810–27819. Mechanisms of Ageing and Development 48:179–189. Insect Biochemistry and Molecular Biology 55:9–18. Toxicology and Applied Pharmacology 243:332–339. American Journal of Physiology-Endocrinology and Metabolism 281:E479–E488. Venny: An interactive tool for comparing lists with Venn's diagrams, http://bioinfogp.cnb.csic.es/tools/venny/index.html. Molecular and Cellular Biology 28:1041–1046. Thank you for submitting your article "Epigenetic Drift of H3K27me3 in Aging Links Glycolysis to Healthy Longevity" for consideration by eLife. Your article has been favorably evaluated by Kevin Struhl (Senior Editor) and three reviewers, one of whom, Matt Kaeberlein (Reviewer #1), is a member of our Board of Reviewing Editors. The following individual involved in review of your submission has agreed to reveal their identity: Adrienne Wang (Reviewer #3). Overall, the referees appreciated the novelty and importance of the work and the provocative new hypotheses suggested. Several major concerns were noted, however, that should be addressed before publication. Many of these concerns involve more thorough integration of these studies within the existing literature and a discussion of how the results fit, or in some cases run counter to, prevailing models for aging. In particular, this study is limited in that it may be unique to Drosophila. While the reviewers found the data to be credible, the proposed model does contradict data in other organisms regarding the importance of glycolysis in aging (large body of CR literature, work from Ristow in worms and mice https://www.nature.com/articles/ncomms4563) and is directly contradicting the current thinking about NAD/NADH ratio and aging. The authors at least need to acknowledge these contradictions and the possibility that this is a private mechanism of aging in Drosophila that will not be conserved in other organisms. Unless they have data to suggest that this is a conserved mechanism of aging, in which case it is strongly recommended that they add it to the paper. There is also a striking absence of discussion of prior literature related to epigenetic marks modulating aging and lifespan in yeast and worms. The studies from Shelley Berger's lab showing that histone acetylation impact aging in yeast should be discussed, as should the work from Anne Brunet and others in C. elegans and in stem cells, some of which specifically deals with H3K27me3. The authors need to put their work into context with the prior literature rather than ignoring it. To claim that this study shows that H3K27me3 is a "new mechanism that drives the progression of aging" would seem an overstatement in light of the prior literature in this area. As another example of missing literature, the authors completely ignore a study by the Rabinovitch group in which quantitative proteomics was used to characterize age-related changes in the heart proteome and in which glycolytic enzymes were shown to increase with age, while calorie restriction was shown to decrease the abundance of these enzymes, promoting health of this tissue (Dai et al., 2014). The referees also felt that in many cases, the data were over-interpreted. For example, the subsection “Long-lived PRC2 Mutants Diminish the Epigenetic Drift of H3K27me3 During Aging”, ends with 'Combined, our study implicates that the life-extension effect of PRC2-mutation likely arises from its ability to mitigate the drifting of H3K27me3 during aging.' At this point in the paper, it has only been shown that PRC2 mutants live longer and that they have reduced H3K27me3 levels. A functional or causal connection between these phenotypes has not been established, and the conclusion is thus not valid. There are many other instances of such over-interpretation, and the authors need to edit the text significantly to more conservatively and accurately interpret the results. In addition, there are a few experimental studies, additional statistical analyses, and additional textual changes that were considered to be essential for further consideration at eLife. 1) There is the lack of detail on the collection, processing, and statistical analysis of the large datasets. It is therefore difficult to evaluate how rigorous the analysis of these data was. Raw datasets (for example FPKM tables for the RNAseq results, as well as cohort data for the lifespan studies – for which statistical analysis is wholly missing) should be made available to evaluate the data. Further consultation with a statistician before resubmission is highly recommended. 2) A majority of the results are based on muscle samples, but the authors occasionally use head-specific samples throughout the manuscript. Though both tissues have high energy demand, their regulation of metabolism is very different. This is something that should be acknowledged in the manuscript. In particular, since epigenetic marks are very cell-type dependent, a clearer characterization and description of epigenetic changes specifically in muscle and brain tissue is warranted. Based on the Materials and methods section, the data was acquired from muscle, but later RNAseq studies also include the brain. Tissue-specificity needs to be clearly described and if transcriptome or metabolomic data from brain is used, then the ChIPseq data should be obtained from brain as well. 3) The metabolomics data raises important unresolved questions that could be addressed. The authors measured a total of 151 metabolites. This likely represents far less than the total metabolome found in Drosophila. The size of their dataset is critical in drawing inference about the key pathways that are associated with lifespan. The authors do look specifically for changes in the TCA cycle, but might there be other equally predictive pathways associated with metabolism that are not represented here given the small number of metabolites measured overall? What happens to TCA intermediates? (ATP levels are down, suggesting glycolysis is the main source of ATP, but this isn't actually measured. What happens to oxphos activity/efficiency? What is happening to the PPP pathway? 4) How does the global loss of PRC2 affect the developmental establishment of H3K27me3 patterns (i.e. do certain marks never get established in the first place? It is mentioned that 'global occupancy of H3K27me3 between wt and age-matched PRC2 mutants was highly preserved', but the correlation coefficient is only 0.77, suggest that there are significant changes in certain loci that are being ignored). A more acute depletion of PRC2 in the adult, for example by RNAi would be useful to analyze its effects specifically on aging-related pattern changes. It would also be important to acutely deplete PRC1 to assess the specificity of the PRC2 effects. And to perturb both PRC1 and PRC2 to establish whether the establishment and/or maintenance of epigenetic marks is affected by age. It is shown that PRC1 mutants have extended lifespan but no changes in H3K27me3, and this discrepancy with PRC2 mutants is ignored – if PRC1 mutants are also long-lived, it seems likely that the longevity effects are not caused by changes in H3K27me3. 5) As this paper is reliant upon accurate metabolic analysis, and the levels of protein and sugar in Drosophila food have documented effects on lifespan and metabolism, the authors should specify the "standard" food their flies are reared on. 6) Given that the authors are studying changes that occur with aging, age is an important factor for the interpretation of most of the figures. Throughout the manuscript, there are many places where age of samples used is not explicitly stated, or is unclear – for example, the samples used for the transcriptomic analysis. 7) The authors show that down-regulation of these PRC2-mediated glycolytic genes blocks the lifespan extension seen in PRC2 mutants, thus establishing that the mechanism of lifespan extension by PRC2 is at least partially reliant upon glycolysis. However, the extent to which downregulation of these genes blocks the PRC2-mediated lifespan extension is unclear from the text and without referring to supplementary figures. As there was only partial reduction of lifespan by knocking down glycolytic genes in comparison to WT, it indicates that other mechanisms might be in play mediating lifespan in this model. This should be explicitly addressed. 8) The authors should rearrange the figures such that the actual data are shown in Figure 2 and the summary table is moved to supplemental. 9) The observations related to NADH/NAD ratio run counter to a growing body of literature suggesting that NADH/NAD ratio increases during aging and that restoring this imbalance (for example through NAD precursors) can increase lifespan and/or healthspan. The authors should at least comment on this apparent discrepancy and offer some speculation about why they are getting an opposite result. 10) The statement "drives the progression of aging" is perhaps overly reaching. It would be better to say that the data presented in this study are consistent with the model that epigenetic drift of H3K27me3 is one of the molecular mechanisms that contributes to at least a subset of age-associated phenotypes and limits lifespan in fruit flies. 11) Typo in the subsection “A CRISPR/Cas9 Deficiency Screen Identifies the Role of PRCs in Aging”: Should read "Given that the above study indicated…"
13) Figure 4C: what is the age of analyzed animals? 14) Locomotion: usually longer distances than 2cm are recorded (e.g. PMID:25850672 uses 8cm in 20 seconds). Any specific reason for short distance? We thank the reviewer for highlighting the significance of the work and the impact to the field. Given the scope of our data, we have now changed the title of the manuscript into: Epigenetic Drift of H3K27me3 in Aging Links Glycolysis to Healthy Longevity in Drosophila. We appreciate the issue raised by the reviewer. In the revised manuscript, we have substantially re-written the background and Discussion to better fit into and further advance our current understanding of aging. We apologize for lack of clarity in presentation of our work. In the revised manuscript, we have added statistic method next to the figure panels and the figure legends; the Materials and methods section also includes more details, including data collection, processing, and statistical analysis. Both raw and processed data files of ChIP-seq and RNA-seq experiments have been deposited in the NCBI Gene Expression Omnibus (accession number: GEO:GSE96654, the following secure token has been created to allow review of record GSE96654 while it remains in private status: adotmsqctzerxol). A detailed lifespan data, including fly number, lifespan curve, median and 10% survival, and statistics, is provided in Supplementary file 2. Dr. Zhandong Liu, a co-author of the manuscript, is an expert in biostatistician and now an assistant professor at the Baylor College of Medicine, Houston, USA, who helped to oversee the procedures of data processing and analysis. For each experiment, we have carefully labeled tissue types used next to the figure panel, in the text and figure legends. Moreover, we have profiled H3K27me3 using dissected heads of Pclc421Su(z)12c253 mutants and their age-matched WT controls, as shown in revised Figure 4 and Figure 4—figure supplement 1. Similar to what we have noted in muscle, our data shows that H3K27me3 in heads has age-associated increase and drift during normal aging in WT animals, and that this shift is partially diminished by PRC2-mutation. To find transcriptional change of particular genes that might play a dominant role in PRC2-dependent life-extension, we compared RNA-seq datasets derived from PRC2 mutants in both head and muscle tissues. This analysis led us to narrow down to two glycolytic genes, Tpi and Pgi, whose expressions were upregulated in both tissue types in all long-lived PRC2 mutants. For untargeted metabolomics and metabolic flux experiments, we used dissected heads to avoid metabolic features carried over from the food residues in the trachea or the gut. For measurement of specific metabolites, we used dissected muscles. Our data consistently supports our conclusion that glycolysis is modulated with age and in PRC2-deficiency. For the metabolomics data set, about 20,000 metabolic features were detected in total, including adducts and isotopes corresponding to the unique metabolite ID. Approximately 30% of metabolic features with MS/MS spectrum were obtained using data-dependent acquisition (DDA) based untargeted metabolomics approach. Among all putatively characterized metabolites, 151 metabolites matched against our standard library were accurately identified with the highest confidence level (Level 1) according to Metabolomics Standards Initiative (MSI). The standard library for spectral match consists of 830 metabolites covering a majority of metabolism pathways in KEGG database. Therefore, the metabolites identified in Drosophila samples are unbiased benefiting from the relative comprehensive library. It is important to note that, in addition to unbiased metabolic analysis, we also have metabolic flux experiment (Figure 6 and Figure 6—figure supplement 2) in which we observed no consistent change in the metabolites of the TCA cycle with age and in PRC2-deficiency, which was in line with constant levels of metabolites as measured by untargeted metabolomics as shown in Figure 6—figure supplement 1B. RNA-seq experiments of individual long-lived PRC2 mutants found no consistent changes in the expression of genes mediating pentose phosphate pathway (PPP), citric acid cycle, and oxidative phosphorylation (Figure 5—figure supplement 1C, Supplementary file 4). These data together led us to conclude that expression and metabolism of the glycolytic pathway is affected with age and in PRC2-deficiency. 4) How does the global loss of PRC2 affect the developmental establishment of H3K27me3 patterns (i.e. do certain marks never get established in the first place? It is mentioned that 'global occupancy of H3K27me3 between wt and age-matched PRC2 mutants was highly preserved', but the correlation coefficient is only 0.77, suggest that there are significant changes in certain loci that are being ignored). We would like to clarify that our data was based on studying heterozygous mutation of PRC2 genes, in which H3K27me3 modification, despite at a reduced level, remained operative in mutant animals. In Figure 3A, Circos plot of the H3K27me3 epigenome illustrates peak profiles that are highly preserved with age and in PRC2 mutants. As noted by Liu et al. (Liu et al., 2011) and a web-based application called Cistrome (http://cistrome.org/ap/root) therein described, the correlation coefficient between +0.7 and +1.0 can be interpreted as strong positive correlation. Nevertheless, we agree with reviewers that we cannot fully rule out the possibility that unknown H3K27me3 targets might be affected by PRC2-deficiency. Thus we have modified the sentence to read as follows: “Interestingly, global occupancy of H3K27me3 between WT and age-matched PRC2 mutants was preserved, as demonstrated by the comparable patterns of peak profiles and genes known to be H3K27me3-modified (pair-wise Pearson correlation coefficients ≥0.77) (Figure 3A, Figure 3—figure supplement 1B and 1C), though we cannot rule out the possibility that certain H3K27me3 targets might be altered.”. A more acute depletion of PRC2 in the adult, for example by RNAi would be useful to analyze its effects specifically on aging-related pattern changes. It would also be important to acutely deplete PRC1 to assess the specificity of the PRC2 effects. And to perturb both PRC1 and PRC2 to establish whether the establishment and/or maintenance of epigenetic marks is affected by age. To knockdown PRC1/2 factors specifically in the adult, we have explored two methods. First, we fed flies with available chemical compounds targeting mammalian PRC2 genes (compound ID: GSK343, GSK503, GSK126, EPZ6438, EPZ5687, UNC1999, and EI1 from Selleck Chemicals, USA). Unfortunately, none of these compounds showed inhibitory effect against Drosophila PRC2 counterpart, as evidenced by their inability to decrease H3K27me3 levels. Alternatively, we combined adult-onset Gal4 driver (geneswitch-GAL4 promoter that can be induced by feeding adult flies with RU486) with pUAST-transgene expressing double stranded RNA against PRC1/2 genes. One RNAi line that we have carefully tested was THU0754 (Tsinghua University, China) against Su(z)12 gene. Induction of this RNAi line caused 20% decrease of Su(z)12 mRNAas compared to geneswitch-GAL4 control.However, for the lifespan experiment, we surprisingly noted that geneswitch-GAL4 flies alone had a dramatically shortened lifespan, to about 65% that of WT animals. Induction of Su(z)12 RNAi had a modest 10% lifespan extension than geneswitch-GAL4 control animals. Though this experiment may seem supportive, we hesitated to further interpret this result because geneswitch-GAL4 alone and perhaps RU486 feeding have already induced strong, confounding aging phenotypes. We feel that there is something quite interesting about the adult-specific deletion of PRC1/2, although to resolve this is beyond the scope of the current studies. It is worth to note, however, that fly behaviors and lifespan phenotypes are particularly sensitive to genetic background. We highlight that all fly lines used in our studies have been either isogenized or directly generated in the control background 5905 (Flybase ID FBst0005905, w1118). These include altogether 29 new site-specific gene mutations as described in Supplementary file 2. It is shown that PRC1 mutants have extended lifespan but no changes in H3K27me3, and this discrepancy with PRC2 mutants is ignored – if PRC1 mutants are also long-lived, it seems likely that the longevity effects are not caused by changes in H3K27me3. While PRC2 complex is required for H3K27me3 modification, PRC1 complex is generally involved in maintenance of the silencing status. Our data that PRC1-deficiency has no effect in H3K27me3 levels is consistent with a prior study by Tie et al., where they observed no detectable change in H3K27me3 upon knockdown of Polycomb gene of the PRC1 complex (Tie et al., 2016). As a result, our CRISPR/Cas9 mutagenesis screen identifies longevity genes functionally related to H3K27me3, including factors of PRC2 in establishing H3K27me3 marks and PRC1 in maintenance of H3K27me3-led repressive function. We apologize for this. We have detailed the food receipt in the method. Briefly, standard Drosophila food contains sucrose (36g/L), maltose (38g/L), yeast (22.5g/L), agar (5.4g/L), maizena (60g/L), soybean flour (8.25g/L), sodium benzoate (0.9g/L), methyl-p-hydroxybenzoate: (0.225g/L), propionic acid (6.18ml/L), and ddH2O to make up 1L of the food. We apologize for this. For each experiment, we have now carefully labeled age of the samples used next to the figure panel, in the main text and figure legends as appropriate. We have re-written the text. The highlighted area is the contour plot, which represents the density function of the scattered points. As shown in Figure 1C that majority (75%) of the points are above the diagonal line, and this shift is further enhanced with age (Figure 1D). While some of the points fall below the diagonal line, our data supported the conclusion that H3K27me3 signals in WT had an age-associated progressive increase. That was 30d old animals. We apologize for this. In revised manuscript, we intended to clearly label age of the samples used next to the figure panel, in the main text, and figure legends. We thank the reviewer for raising this point. We noted that Figueroa-Clarevega and Bilder (2015) used 8cm distance to measure both climbing ability and climbing speed (Figueroa-Clarevega and Bilder, 2015). Compared to their settings, our locomotion experiment (2cm) was simplified as we only aimed at discerning whether climbing ability was modulated with age and in mutants. For the same purpose, Liu et al. used 1.5cm that was sufficient to characterize the climbing ability (Liu et al., 2012). is affiliated with Singlera Genomics, a company providing customized next generation sequencing services. The author has no financial interests to declare. We thank Drs. Jilong Liu, Yun Zhao, Meng-Qiu Dong, Cong Liu, Chao Tong, Xing Guo, Lanfeng Wang, and Ye Tian for advice on the manuscript; Wei Wu and the Core Facility of Drosophila Resource and Technology, Shanghai Institute of Biological Sciences, Chinese Academy of Sciences, Shanghai, China for fly microinjections. Prof. Junying Yuan provided considerable support, advice on the experiments, and critical suggestions on the manuscript. NL and ZZ are Junior Scholar of the 1000 Plan of China. YZ is supported by 100 Talents Program of the Chinese Academy of Sciences. This work was supported by grants from the National Program on Key Basic Research Project of China to NL and YZ (2016YFA0501900); the National Natural Science Foundation of China to NL (31371326), YZ (31671428, 31500665, 31530041), ZZ (21575151), and FL (81770143); a National Institute of Health grant (GM120033) to ZL; a National Science Foundation grant (DMS-1263932) to ZL; a Cancer Prevention Research Institute of Texas grant (RP170387) to ZL; the Robert A and Renée E Belfer Family Foundation to ZL, and the Chao Family Foundation to ZL.